Li River cruise - we try to illustrate the spectacular scenery of the landscape and describe the unforgettable experience of this cruise. But frankly – this is only the first step – the real “voyage” has to be experienced personally. I’m wholeheartedly suggesting you this trip. But every rule has an exception, and here is the one: New Eyes cannot see what is beyond the imagination. And that is exactly what you will experience on the Li River cruise. 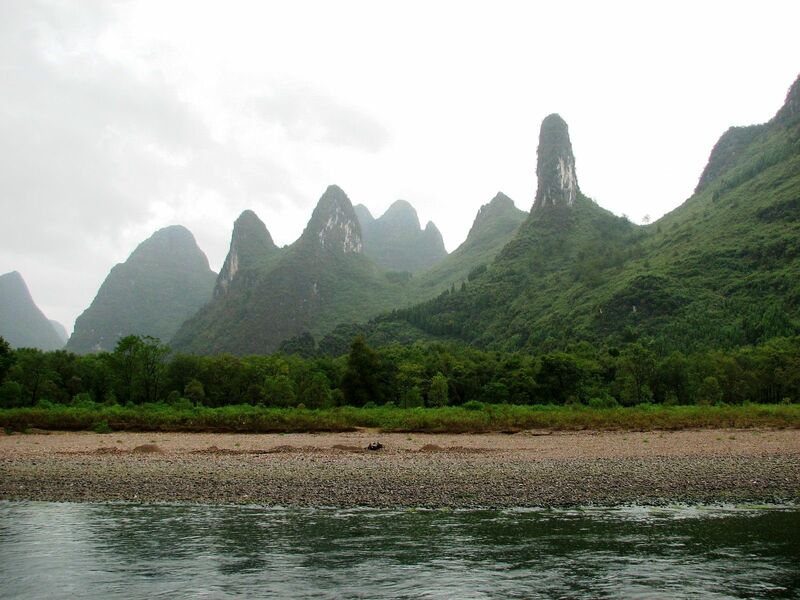 Unimaginable becomes the reality at almost every bend of the Li River. As the boat keeps moving down the river, the seemingly endless landscape of spectacular limestone peaks opens in front of your eyes. Due to the hot and rainy climate they are all covered by thriving vegetation and moss – somehow softening the raw power of the bare rock but without diminishing its majesty. Breathtaking beauty of the Li River's landscape. Here and there you may see fishermen on their narrow bamboo rafts and if you are really lucky you may even witness the “spectacle” of cormorants’ fishing. These days however the “fisherman” more likely will use the “bait” to sell all kinds of souvenirs to the tourists on the boats. Dream comes true and it goes on and on....bend after bend new marvels shaped by the nature's hands. Rice paddies, water buffaloes pulling carts along the river or cooling off in the water constantly shift in front of you like pictures in an old kaleidoscope. The marvelous peaks popping up in front of you let you only guess which turn will take the river at the next bent and believe me – it is not an easy guess! Well, one picture is worth more than thousands words and this is certainly true for Li River pictures. Even though it is already several weeks after the cruise, my feelings are still so fresh, vibrant and touching to the heart as it was yesterday. I realized the limits of my vocabulary……. Although the weather was not on my side when taking these photos (sun would add the warm colors), I believe they captured the fascinating landscape. As the matter of fact, it came to my mind when looking at these Li River photos that the foggy air and low laying clouds gently touching surrounding peaks not only contributed to the mystery of this area but also opened a room for imagination.